Walk Kansas is an 8-week health initiative that encourages individuals and teams to reach health goals. Participants receive a weekly newsletter which includes articles about health, exercises, tips, and nutritious recipes. This year Walk Kansas is specifically focusing on the importance of stretching and will include an optional pre/post fitness assessment for participants to measure their improvement over the 8-weeks. Participants log minutes of moderate or vigorous activity daily and report online or to a team captain. Activities besides walking such as strengthening exercises, yoga, bike riding, team sports and others count toward Walk Kansas minutes. 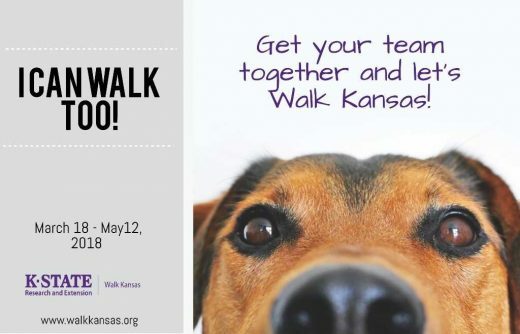 Teammates do not have to walk or exercise together, but are encouraged to connect and support each other, which is made easy through the online Walk Kansas system. 8 Wonders Challenge: Each team member has a goal to log 2.5 hours of moderate to vigorous activity per week. Collectively the team would walk 435 miles over the 8-week program. This trail is featured in Marci Penner’s 8 Wonders of Kansas Guidebook. Cross Country Challenge: Each team member logs 4 hours of activity per week which would take the team on a 764 mile trail over the span of the program. Little Balkans to Nicodemus Challenge: 1,200 mile Kansas trail, with each team member logging 6 hours of moderate-to-vigorous activity each week. 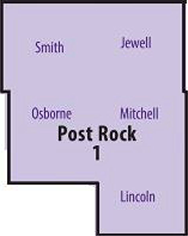 For Post Rock District Walk Kansas participants, the program cost begins at $8. T-Shirts can be purchased at an additional cost. This year will have many giveaways including a few 8 Wonders of Kansas books, Walk Kansas ¾ sleeve t-shirts, hoodies, and more! Poker walks will also be happening across the district so be sure to join in on the fun! Join our Post Rock District Walk Kansas group on Facebook to learn more about Walk Kansas. Participants will have the opportunity to earn 4 Health Quest credits upon completion of the program. Register today at any Post Rock District office or at www.walkkansasonline.org! Are you ready for severe weather and emergencies?